Jonah Larson, who started crocheting at age 5, has thousands of social media followers from around the world. 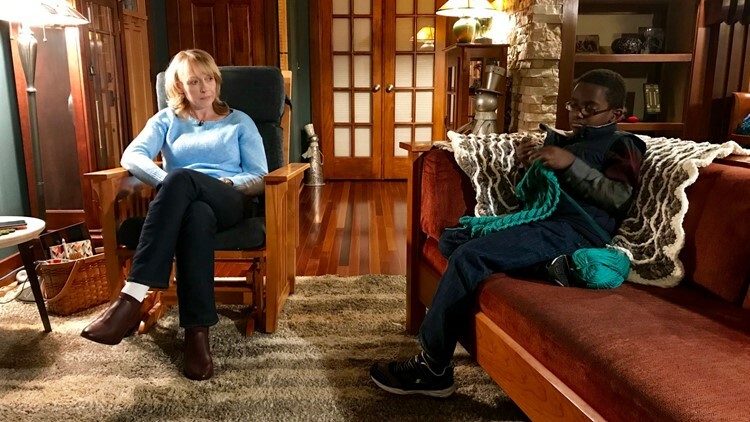 LA CROSSE, Wis. — If crocheting conjures up images of grandmas in rocking chairs, 11-year-old Jonah Larson might just rock your world. Afghans, pillows, mittens and throws – each crafted to heirloom quality – are draped over chairs. All were created by Jonah, social media’s crochet prodigy. Jonah’s mother, Jennifer Larson, laughs and says, “He’s a crochet celebrity.” Based on the volume of Jonah’s fan mail, it’s no exaggeration. Jonah’s work is celebrated on crocheting social media sites. More than 20,000 people, from the U.S. and abroad, follow his Instagram page – though Jonah’s early posts were met with some skepticism. Jonah Larson and his mother Jennifer Larson hold up a blanket Jonah crocheted from scrap yarn. 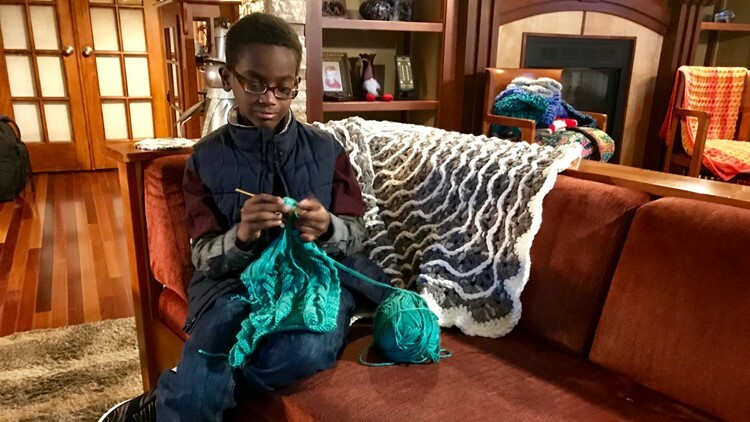 Jonah’s crochet foray started at the age of 5, when he plucked from a bag of his aunt’s discarded craft items a crochet hook – which led him to YouTube, where Jonah found a basic crocheting video. “And from there on I was hooked,” Jonah says. 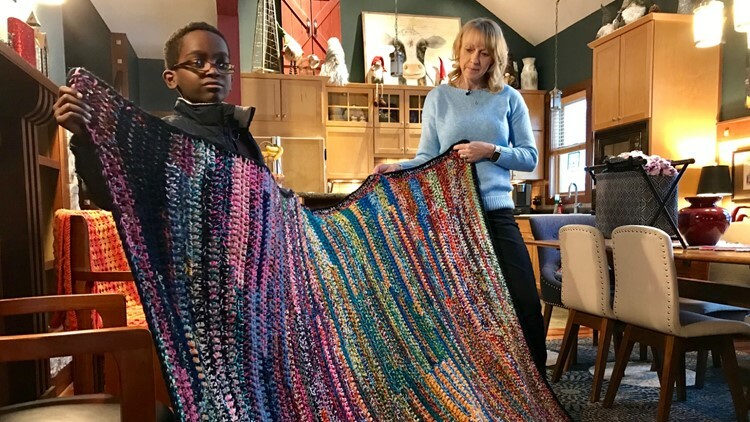 Eleven-year-old Jonah Larson crochets on his couch after school. Jonah’s first project: a dish cloth for his mom. “And he made it perfectly,” Jennifer says. Jonah’s mom doesn’t crochet herself. She jokes that the only crocheting hooks she picks up are the ones Jonah leaves around the house. But seeking some expertise to help her son, Jennifer began posting pictures of his work on crocheting social media pages. And with that, the legend of Jonah began to take shape. “People will comment, ‘I’ve been crocheting for 40 years, I can’t do that,’” Jennifer says. A master's hands at work: 11-year-old Jonah Larson. Now in the sixth grade, Jonah crochets about five hours a day. “Sometimes he gets up early, before I even get up. He's at the table crocheting at like six in the morning,” Jonah’s mother says. Even bedtime doesn’t stop him. “'I'm going to sleep now mom,’” Jonah may tell his mom, “but underneath that cover there's crochet hooks and a flashlight,” Jennifer says. Some creations Jonah makes for his mom, but others he sells. After the La Crosse Tribune featured Jonah in an article, 1,500 orders poured in. His mom began responding with a form letter, realizing her son couldn’t possibly get to them all. Jonah Larson works on a baby blanket. 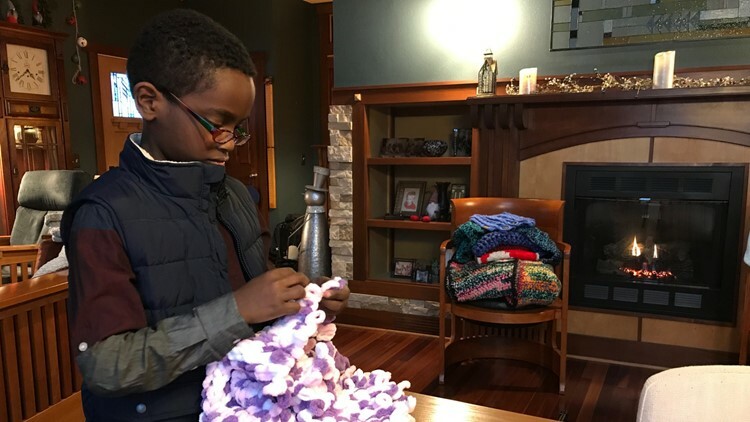 As Jonah gains status as a social media influencer, a yarn company has offered him a sponsorship – and several times a week, boxes arrive on his family’s porch filled with fan mail and gifts. One recent day’s haul included yarn, pattern books and a pair of Air Jordan shoes. Jonah Larson and his mother inspect the contents of gift boxes delivered to their home. Yet the kid of a thousand out-of-town “grandmas” started his life alone. 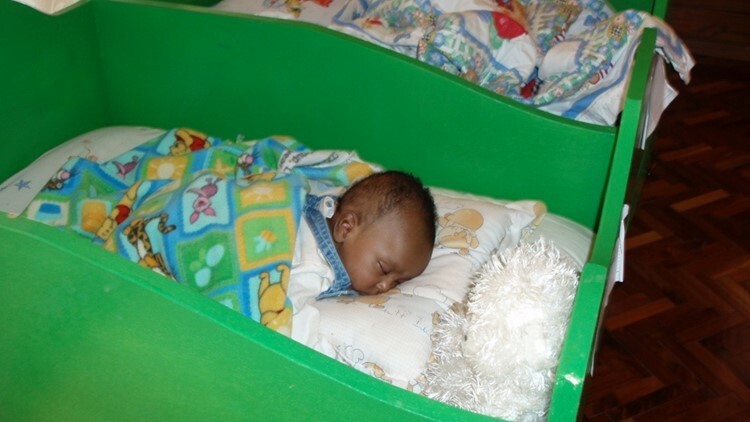 As a newborn in Ethiopia, Jonah was abandoned by his birth mother along a trail in a wooded area. A woman on her way to get water heard his cries and delivered him to the orphanage where Jonah spent the first five months of his life. When Jonah was adopted by the Larsons, he was malnourished and sick. Upon his arrival in La Crosse, Jonah’s parents spirited him directly to the hospital. “There was a really high possibility he would have some cognitive delay,” Jennifer says. Jonah Larson in a photo taken by his adoptive mother at an orphanage in Ethiopia. When asked about his difficult start, Jonah crocheting fingers never slow. “Yeah, lucked out,” he says. Nary is there an ounce of hesitation when Jonah is asked what brings him happiness. “My family, my two dogs and crocheting,” he says. Jonah's favorite time is crocheting with his mom close by, Jonah on the couch and Jennifer a few feet away in her rocking chair. Jennifer Larson spends time with her son Jonah after school. They talk about his improved behavior at school. “I used to be a bit of a rascal,” Jonah acknowledges. Jonah and his mom concur the tide turned for Jonah when his fifth grade teacher let him crochet at school. By keeping his mind occupied, crocheting kept Jonah out of trouble. Jonah's older brother used to warn Jonah not to mention his hobby at school. Jonah ignored his brother's suggestion. "He really doesn't care what other people think of him, he never has," Jonah's mother says. 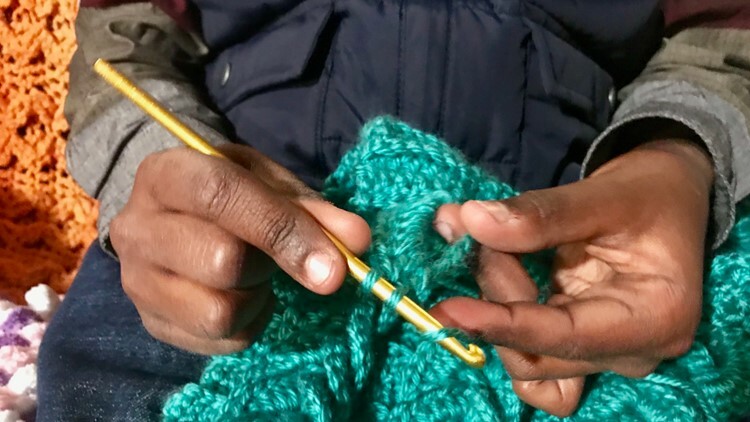 "He’s like, 'Mom, I’m black and I have white parents and I live in a white community,' so the crocheting - couldn’t care less." Now, as a sixth grader, he’s mastering advanced ninth grade algebra - with bigger things ahead. “I'm planning to attend West Point, the academy, and then becoming a surgeon. This is kind of helping me prep for that,” says Jonah, glancing toward his lap, in which a blur of fingers crochets another Jonah Cowl. Dr. Jonah Larson's patients will be in good hands. Follow Jonah on Instagram or get in touch through Jennifer's Facebook page!